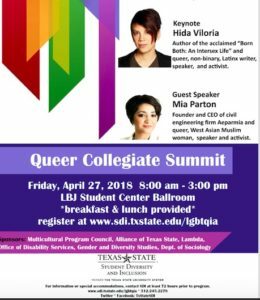 Hida Viloria | Presenting Keynote at Texas State University’s Queer Summit! Presenting Keynote at Texas State University’s Queer Summit! April 27th, 2018. 12-30–2:30pm, followed by book signing. ← Born Both to be Published in German!